Left: Morphological evidence of the association of PfNSF with vesicular structures in parasitized erythocytes. Immunoelectromicroscopy for PfNSF was performed as described under “Experimental Procedures,” and the localization of PfNSF was visualized with immunogold particles after silver enhancement. The whole body of a parasitized erythrocyte (A), plastid-like organelle (B), or cytoplasm of erythrocyte (C and D) is shown. Vesicles containing PfNSF in erythrocyte cytoplasm are indicated by an arrowhead in A and by arrows in C and D. FV, parts of food vacuoles; E, erythrocyte cytoplasm; EPM, erythrocyte plasma membrane; P, parasite cytoplasm; TVM, tubovesicular membrane network. Bar, 1 mm in A and 0.2 mm in B–D.Right: Parasitized erythrocytes were probed with anti-NSF Abs. Bar, 10 mm. Arrows indicate extra-parasitic vesicles.Hayashi M, Taniguchi S, Ishizuka Y, Kim HS, Wataya Y, Yamamoto A, Moriyama Y. A homologue of N-ethylmaleimide-sensitive factor in the malaria parasite Plasmodium falciparum is exported and localized in vesicular structures in the cytoplasm of infected erythrocytes in the brefeldin A-sensitive pathway. J Biol Chem. 2001 276:15249-55. Change in the distribution of PfNSF during development. Parasitized erythrocytes at various stages as indicated were doubly labeled with antibodies against NSF and 49,6-diamidino-2-phenylindole HCl and observed under a Nomarski microscope (upper panel) and a fluorescence microscope (lower panel). After superpositioning the two images, the localization of PfNSF (green) and nuclei (blue) is shown. R, ring; ET, early trophozoite; T, trophozoite; S, schizont; M, merozoite. Bar, 5 mm. A similar degree of anti-PfNSF immunoreactivity was observed in all stages of intraerythrocyte parasites, indicating that PfNSF is expressed in all cell stages. At the early trophozoite stage, PfNSF appeared in the extraparasite space and seemed to be associated with several apparent vesicular structures outside the parasites in the erythrocyte cytoplasm. At the trophozoite stage, the PfNSF-positive vesicular structure seems to be more discrete and distributed throughout erythrocyte cytoplasm, which becomes weak at the schizont stage and disappears at the merozoite stage. 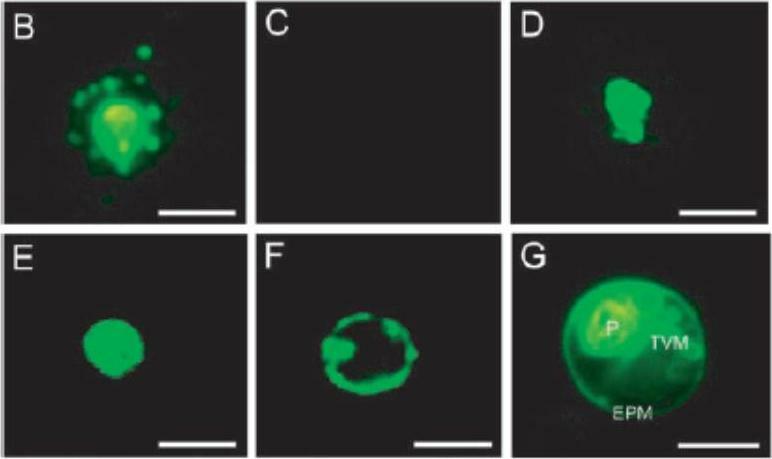 These results indicate that export of PfNSF occurs at the early trophozoite stage.Hayashi M, Taniguchi S, Ishizuka Y, Kim HS, Wataya Y, Yamamoto A, Moriyama Y. A homologue of N-ethylmaleimide-sensitive factor in the malaria parasite Plasmodium falciparum is exported and localized in vesicular structures in the cytoplasm of infected erythrocytes in the brefeldin A-sensitive pathway. J Biol Chem. 2001 276:15249-55. Pf NSF is associated with coated vesicles and Maurer clefts. (A) Western blot analysis of uninfected RBCs and IRBCs showed that Pf NSF was an approximate 89-kDa Triton X-100–insoluble, SDS-soluble protein that was absent in uninfected RBCs. 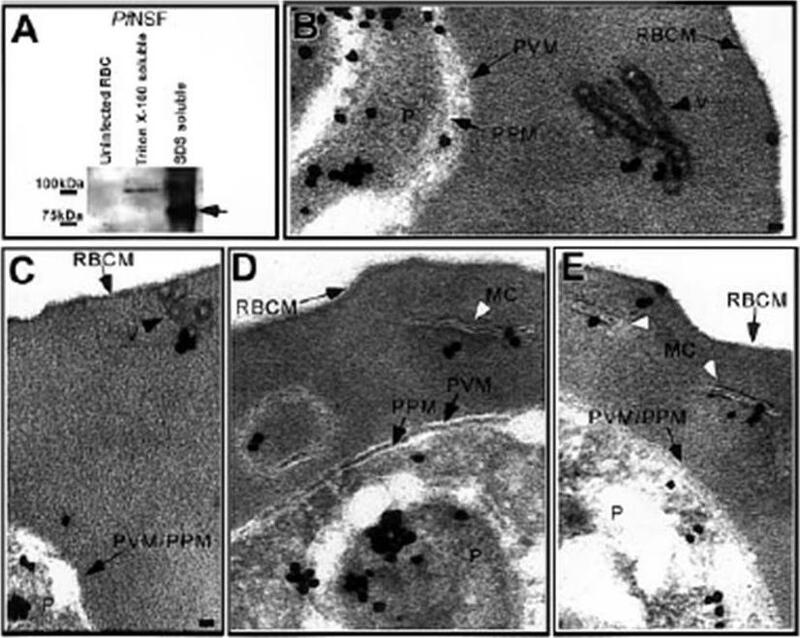 Immunoelectron microscopy showed Pf NSF associated with (B) chains of coated vesicles in the RBC cytosol, black arrowhead, (C) coated vesicles closely apposed to the RBC membrane, black arrowhead, (D-E) the Maurer clefts, white arrowhead, (D) a large, double membrane structure in the RBC cytosol, and (E) transitional areas between a Maurer cleft and the RBC membrane. Scale bar 70 nm.Taraschi TF, O'Donnell M, Martinez S, Schneider T, Trelka D, Fowler VM, Tilley L, Moriyama Y. Generation of an erythrocyte vesicle transport system by Plasmodium falciparum malaria parasites. Blood. 2003 102:3420-3426. Immunohistochemical detection of PfNSF. (B), PfNSF in noninfected erythrocyte (C), vacuolar H1-ATPase subunit PF13_0065 A (V-ATPase) (D), H1-pumping pyrophosphatase (V-PPase) PF14_0541 (E), and the serine repeat antigen protein (F) in parasitized erythrocytes. The parasitized erythrocytes were immunostained with the indicated antibodies and then observed by fluorescence microscopy. Vital staining with C5-ceramide was also performed to reveal localization of the tubovesicular membrane networks (TVM) (G). P, P. falciparum cell; EMP, erythrocyte plasma membrane. Bar, 5 mm. the PfNSF immunoreactivity was present within the vesicular structures outside the parasite cells (B). No such extraparasitized vesicular structures were observed in the immunoreactivities against antibodies for vacuolar H+-ATPase (D), H+-pumping pyrophosphatase (E), serine repeat antigen protein, markers for the peripheral space between the parasitophorus vacuolar membranes, and the plasma membrane of the malaria parasite (F).Hayashi M, Taniguchi S, Ishizuka Y, Kim HS, Wataya Y, Yamamoto A, Moriyama Y. A homologue of N-ethylmaleimide-sensitive factor in the malaria parasite Plasmodium falciparum is exported and localized in vesicular structures in the cytoplasm of infected erythrocytes in the brefeldin A-sensitive pathway. J Biol Chem. 2001 May 4;276(18):15249-55.